Am I the only one obsessed with sheet-pan dinners? I mean, what’s easier than tossing everything with balsamic and herbs and throwing it in the oven for 20 minutes! This is my favorite clean-out-the-refrigerator dish. I make this with what ever combination of vegetables I have on hand. You can easily marinate this ahead of time and keep it refrigerator, then dump it on the sheet pan when you’re ready to eat. I’m really impressed with these lightly dried herbs from Gourmet Garden, they smell amazing when you open them up and last up to 4 weeks in the refrigerator once opened (and they are already chopped!). A great solution for all those people who ask what to do with all those herbs you can’t use up. Of course, fresh herbs would also work fine here. Spread out onto the sheet pan.Nestle the chicken in with the vegetables and roast until tender in the lower rack of the oven, about 20 minutes until the chicken is cooked through. Amazing!! I used boneless skinless chicken thighs and added mushrooms and it was so flavorful! I’ll definitely make this again!! 5 freestyle points for the thigh version. Goodness gracious that’s delicious. I doubled the recipe and added some more garlic. Everything was bursting with flavor and the chicken was moooooist. I zapped my portioned leftovers in the microwave for 1:30 covered in a damp paper towel and it was perfect! ???????????? Made this yummy recipe last night and it was excellent!!! I only made the chicken – not the vveggies. Tasteless. I marinated for three hours and couldn’t believe how tasteless this was. .
Made this last night and it was delicious! Served it with spiced up Quinoa. My husband loved it too! I will be making this again! Do you need to flip the chicken ! It is so quick easy and delicious ! The other day for lunch I ate leftovers from this recipe served cold in a whole wheat tortilla wrap, with a spread of Fage 0% plain Greek yogurt mixed with Hidden Valley Ranch Greek Yogurt Dips mix (0 Freestyle Points). For tortillas, I prefer Ole Exterme Wellness High Fiber Tortilla Wrap (1 Freestyle Point). It was AMAZING!! I make this recipe frequently and this is my favorite new way to enjoy it for lunch the next day! Thanks Gina for all your fabulous recipes! Your recipes make it so much easier for my family to enjoy eating healthy! Good idea. Thanks for sharing! Great idea, I will try this! Heavens part, angels sing! Wow. So easy and so delicious!!!!!! I will make this over and over and over and over x infinity! Thanks for the recipe. Making it for the first time? Few things to note: Garlic is in the ingredients list but not the instructions. Add it to the chicken marinade. Chopped basil and parsley means dried stuff. I think. No need to buy olive oil spray. I bought it and…not in the instructions. Thanks! So good and so much flavor!!! Will be a regular! Chicken is now a zero point food on Weight Watchers so 1/4 of this recipe is ONE POINT!! Happy day!! sheets and got rid of my sorry-50 year old pans. Gave them to my husband for use in the garage…lol. This was indeed fast, easy, colorful and tasty. I didn’t change anything except to not use cauliflower since my husband doesn’t care for it. Asparagus is in season now so it is really fresh and inexpensive. I just served it with some fresh fennel and Persian cucumber strips as a side and a seeded baguette. Perfect. 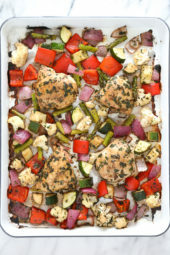 What makes this sheet pan dinner non keto friendly? Fantastic! My family loved it and my son kept making puppy dog eyes at the rest of us to leave enough for leftovers. I used about 6 cups of veggies and I think there would be enough dressing to use even more next time. I had the points to spare so I also added potatoes. This recipe sounds delicious! If I made this on a Sunday and wanted to use each of the 4 servings over the course of 4 days, is it safe to simply refrigerate the servings and not freeze them? Thanks! So much potential and yet so disappointing. Bland, could have done the same thing with a bottle of salad dressing and saved time. Bummer because other ST recipes have been good. Me and my husband loved this! The chicken thighs and seasoning make it extra tasty. Could experiment with different veggies. Delicious! 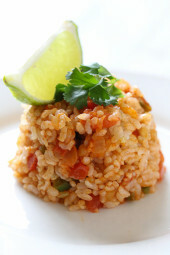 Very flavorful and incredibly easy to prepare. Super easy recipe, super delicious to eat. So very happy that you included freezer instructions, as probably half of the recipe will spend some time in the freezer.Thank you for such an amazing web site and your many recipes!!! Absolutely fabulous and so easy! Entire family loves this one!! Gina, LOVE this recipe. When I put it in WWs Recipe Builder I got 1 Freestyle Smart Point. What am I doing wrong? Thanks! This was incredibly delicious! My 18 year old son asked,”Mom ,is this hard to make because you need to make this everyday. ” This will be a go to. And so easy! Thank you! We enjoyed this for dinner tonight. So easy and very tasty. Thanks for another keeper recipe. When it lists serving size as 1 piece of chicken breast, does this mean 1 piece of chicken breast before it was cut in half or 1 of the half pieces? One of the half pieces. Wow, just wow! Made this tonight and it was quite the hit. I cut and marinated everything last night so when I got home work work it was as easy as dumping onto a pan and throwing in the oven. Thank you for another delicious recipe! This is an easy and delicious meal that my whole family enjoyed. Hardest part was cutting up the veggies. My son even said it smelled so good as it cooked. Loved this recipe, so moist and delicious. I didn’t have asparagus, so I substituted green beans. Any vegetables would work. this may be my new favorite chicken recipe! i went with a rainbow of veggies – red and orange peppers, yellow squash, asparagus and broccoli, and red onion. 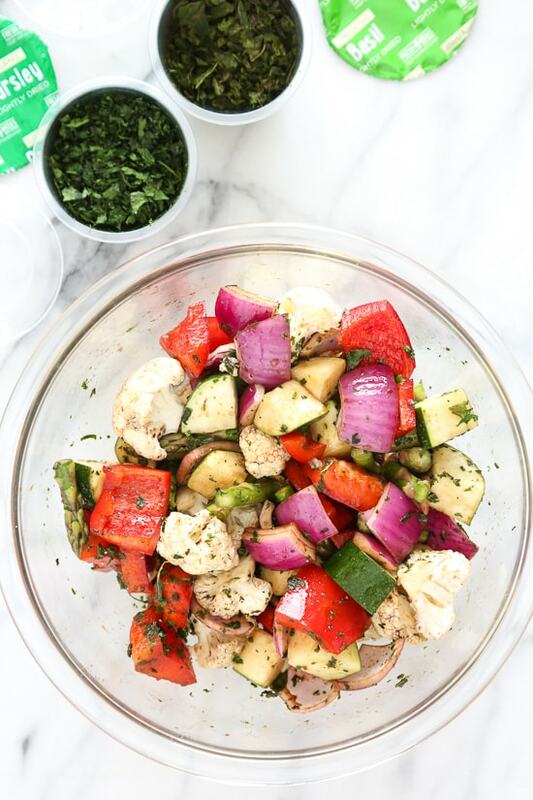 beautiful, healthy, and super flavorful! thanks gina! This was amazing. I was afraid my 15 year old, who does not like balsamic dressings, would not like it, but I think the sugar and the roasting process mellowed it out. All three of my kids (and my husband and I) loved it. I especially loved the variety of veggies because the one who loves mushrooms and not red peppers was happy and one ones who love red peppers but not mushrooms were happy. Thanks! SO happy everyone liked it!! Delicious and easy to make. My entire family enjoyed this meal! Wondering if you can tell me what brand sheet pa is in your pictures? It is beautiful! I’m planning on this recipe for tonight!! Wondering if roma tomatoes would work with this. Has anyone tried including them. This recipe looks yummy but one recipe won’t be enough for my family of six. Is it possible to roast two pans at once rotating half way through the time or do I need to roast them one at a time? Just made this for dinner and it was delicious. 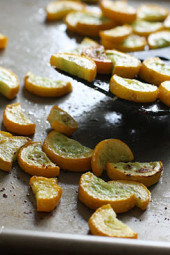 I also loved this recipe as it got my husband to come into the kitchen and help me out by cutting up vegetables for me. A double winner for me. Is this recipe in one of your cookbooks?! In the oven now !!! Smells and looks delish! I don’t like to cook. But, since I’m trying to do Weight Watchers (lost 30# so far! ), I’m branching out and trying to do new things. I made a variation of this meal tonight, and it was wonderful! It’s just me and my husband at home, so I doubled the recipe and have enough for three generous lunches this week – lots of chicken and lots of veggies! Thanks, Gina, for simple recipes that non-cookers like me can follow! What sheet pan do you use for roasting? My pans keep warping. Love your site! I used to have that problem with the sheet pans I bought at the grocery store. I bought new ones at the restaurant supply store and they work so much better! No warping! Check to see if you have a restaurant supply store in your area. Try USA pans. They are great and don’t warp. Garlic is on the list of ingredients, but I don’t see where this is added under the directions? Did you use dried herbs for the chicken and fresh herbs for the vegetables – it is a bit confusing. I want to make this tomorrow night so just want to be clear. This was AWESOME!! I prepped everything the night before, so it marinated over night, and I doubled it. Sooo, so good!! I’ve been using your recipes for a while now, and I’m never disappointed. I decided to do the Whole30 for the month of April, but wasn’t into THEIR recipes. So glad I checked your site! You always create recipes to food I wanna EAT!! I’ve already meal planned for the rest of the month, and doubling everything so I have enough for lunches! Thank you so much for all your recipes!! AND labeling them with the different diet types! You make me feel like staying committed won’t be that challenging. Made this tonight and wow! It was soo good and soo easy. Can’t wait to make it again! I am eating this right now. I thought I would put it on a bed of brown rice. It is really quite filling. I am seriously unable to eat the whole thing. Next time, I’m going to throw in some tomatoes and mushrooms, because I think they would be a nice addition. I’m happy to add this to my recipe rotation. Are the herbs used in this recipe meant to be dried or fresh? In the ingredient list it says “chopped” which leads me to believe fresh but then in the instructions for marinating the chicken it says “dried”. It doesn’t say dried for the herbs used for the veggies. Does that mean to use fresh? Well I used lightly dried, which is similar to fresh. Loved the recipe! However, because the chicken released some liquids in the oven, the vegetables on that pan steamed instead of roasting. I would suggest just putting the chicken and veggies on different pans. I have a problem with the time….I was in the kitchen prepping for 30 minutes, which you say is the total time. Have not yet put it in the oven but am sure it is going to be delicious.. I just had not planned on such a late dinner!!! Lots of chefs/bloggers underestimate the time, which I find…..annoying. I am always looking for quick recipes. Also, I have a large sheet/jellyroll pan and had far too many veggies to fit around the chicken. Your older version of this recipe said the veggies should not touch the chicken or the chicken would steam-cook. Even touching the chicken, the veggies did not fit. I just will use another pan to roast the excess. Would love to make this for guests. 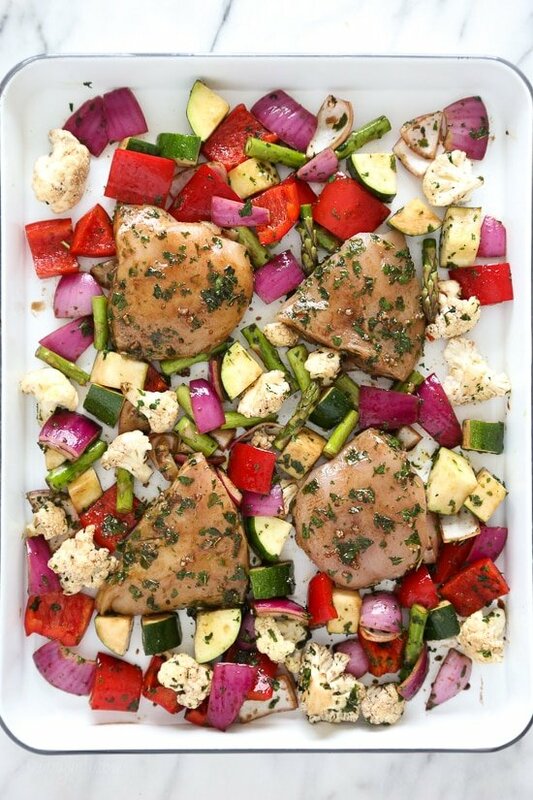 Can you double the recipe and cook in one full sheet pan, or will it be too crowded? You can double it, but use two sheet pans. Thank you, I did double this with two sheet pans and it was a huge success! Even the kids yummed it up. This is such a winner for hosting guests — super quick (prep ahead) and absolutely delicious! First dinner in a long time where I was able to enjoy time with my guests instead of rushing around the kitchen. Thanks for another wonderful recipe, and the introduction to the Gourmet Garden herbs. Hi there! This recipe is so delicious and super easy to prepare. My family gobbled it up! And the veggies kept up for leftovers at lunch the next day! Winner winner, chicken dinner! 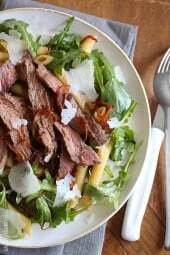 I am a big believer in reviews and have loved every one of Ginas recipes. This recipe, however, was bursting with flavor and the chicken had only been marinated for the time it took me to cut the veggies and stir up with the marinade. The chicken was so juicy and tender. We will definitely be making this meal a staple! Highly recommend. Gina, how would I go about substituting dry herbs? I’m awful at conversions like that. Thanks! You can’t mess this up, you can use slightly less than the amount listed. I prepped in the morning and cooked in the evening. Unfortunately for me the chicken came out very bland. Not sure what went wrong! With all those herbs and balsamic? Maybe you just need more salt? This is so easy to prep in the morning the toss in the oven for dinner! It was great with sweet potatoes as well. I am loving those herbs too! They make it so easy to cook meals without tons of planning! This looks great and I am going to try it next week! I made this tonight for my husband, my mom and. Myself. It was delicious. Thanks for the great recipe. Hi Gina, Congrats on your new home and James Beard nominations. I am delighted to see your hard work and generosity in sharing the consistently great results of your efforts resulting in good things for you. I too got dropped from your email subscription list during the same time frame as a previous poster, so I mention it to see if you might have a systemic issue? Thank you. I made it with boneless chicken thighs tonight and it came out great. Did you have to adjust your cooking times for the thighs? For several years I was a subscriber to Skinnytaste.com. Then, several months ago, I mysteriously stopped receiving your recipe blog in my email. I have tried to sign-up again, but I have had no luck. The prompt I get informs me that my email address is not in a valid format. Huh? My email address has always been the same. I just added you again, not sure why! So sorry! Any thoughts on how long to bake if you use boneless skinless breasts? Hi, the opening of the recipe specifies boneless, skinless chicken breasts and the baking time is noted as 20 minutes until chicken is cooked through. That temp is set for the breasts to be halved. Gina,what a great idea! Thank you for the ‘find’ of the gourmet garden dried herbs…they have a really nice website. This recipe is in my ‘mix’ for next wk. Thanks a lot. Just wondering…would it hurt to make this ahead? Looking for something to prepare the night before so I can just dump it on a pan and bake it the next day. Would I just leave everything marinating in the fridge? Sorry I’m new at this! Delicious! I made it with zucchini, green beans, mushrooms, red onion, red bell pepper! Hi, Gina! I, too, am in love with sheet pan dinners. They are absolutely the best for delicious and easy dinners. Your recipes are always delicious and I have saved many of them! Hopefully, you’ll keep posting new options for the sheet pan. Best wishes on your new home! I calculated this in the Weight Watchers recipe builder as 4 SP., You list it as 7 SP, did I miss something? What do you do with the mozzarella? Sorry everyone, that was a typo!